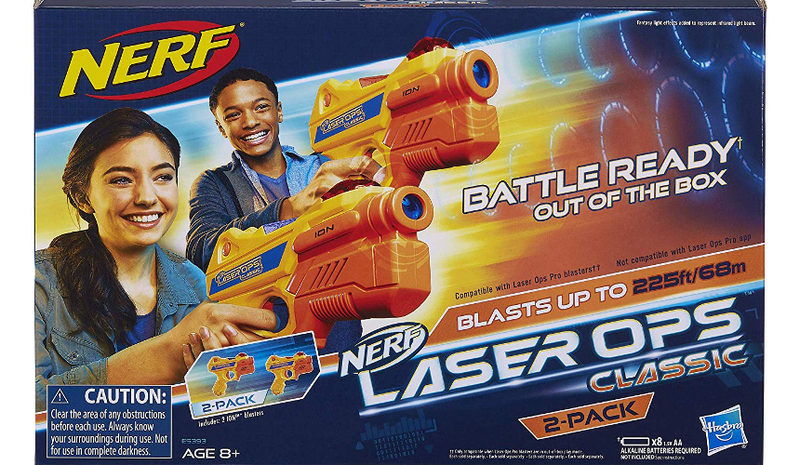 A great basic laser tag set, but not quite a better deal than the old 2-pack. After releasing the Alphapoint and Deltaburst last year, Nerf starts this year’s Laser Ops releases with the Classic Ion blasters. The blasters are a smaller, simpler model compared to the previous blasters, and they’re meant purely for jumping into a game with your friends. However, between their lesser capabilities and their current price point, you may end up waiting on the purchase. The Ion blasters are about the same height as the Alphapoint, but are only two-thirds the length. It’s also about two-thirds the weight, including the batteries. The handle is a tad shorter, and for larger hands the grip may not be the most comfortable. However, given the light weight of the blaster, any discomfort should be relatively minor. All of the standard buttons are on the blaster – trigger, reload, power, etc. This time around, however, there is no switch to differentiate between environments (day/night). The box still claims up to 225′ ranges, but makes no mention of the testing environment. As with the previous pistol, 4 “AA” alkaline batteries power the blaster. In this case, the batteries go in a tray above the grip. (You need 8 batteries total for the two pack. Iron sights are molded into the shell and the IR receiver. They’re a nice touch, but very wide for such a small blaster (but still useful). Ammo and health are shown on the rear LED-backed display, the same way as the Alphapoint. As expected, the blaster feels solid in hand. The trigger feels responsive, with a satisfying “click” at the rear of the motion. The Laser Ops Classic blasters are meant for ad hoc play, with no app needed. In fact, they aren’t even compatible with the Laser Ops app – it does not recognize them. The single player attachment that goes on the front of the Laser Ops Pro blasters, likewise, cannot lock onto the Ion’s shell. It can be used with the Laser Pro blasters in regular games, however. This pack is for quick multiplayer games, plain and simple. 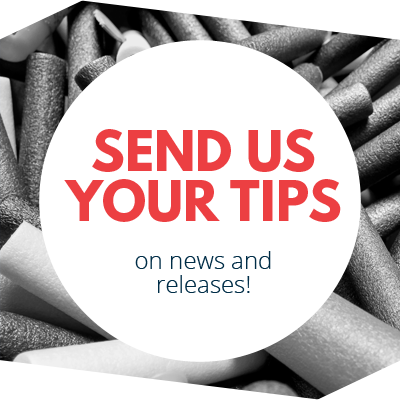 You follow the same steps as the other blasters for a quick setup. Turn on the blaster, press the reload button to select the red or blue team, then pull the trigger to lock it in. If you’re playing free-for-all, choose the purple option. Teams are shown by the LED Indicator at the top of the blaster. You have five hit points of health, and the IR receiver lights up when it detects a hit. After hit number five, the music plays and you’re out. Of course, you can wait a few second, pull the trigger to reset the blaster, and join back in. In game, the blasters have seven shots, and the indicator for ammo will go from green to yellow to red (with flashing at the transitions). After the last shot, you have to reload. This is where the blaster behaves differently. With the Alphapoint and Deltaburst, you could fire essentially as fast as you could pull the trigger. The Ion, however, seems to have to complete its firing sequence, sound and all, and ignores you if you press the trigger too soon. As a result, the rate of fire is fairly slow – it takes roughly four seconds to fire all seven shots. On the upside, the reload on these blasters is near-instantaneous. 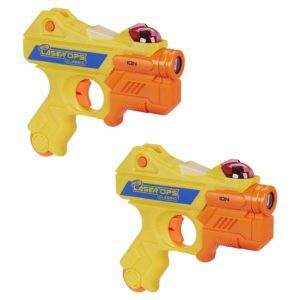 With the previous blasters, you had to wait two seconds for the blaster to finish reloading. In theory, the blaster doesn’t feel too out of balance, but that slow rate of fire means that (in practice) other blasters have lots more time to hide when hit, whereas the Pro blasters can quickly get several hits in the same time frame. This will need more testing, but the difference could end up causing a balance issue with the original blasters. The Laser Ops Classic 2-Pack is made for jump-in multiplayer laser tag, and it does that job well. It trades off App functionality (scoring, single player, upgrades) for a simple, albeit slower firing experience. However, it debuts at $30; as of this writing, the Alphapoint 2-pack had also settled down to that price at major retailers. Since the original could also play multiplayer out of the box, in addition to all of the App functionality, there’s not much incentive to buy the new product. The Ion blasters are attractive and functional, but time will tell if the smaller, newer option can compete with the older brothers. I’ll make an update post after more extended play to see how opinions change after seeing more people use these. 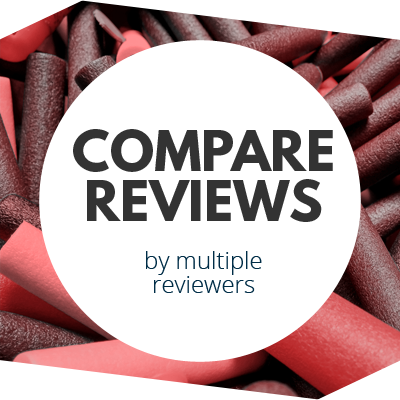 This entry was posted in Laser Tag, Reviews and tagged 2019, blaster, blaster hub, hasbro, ion, laser ops, laser ops classic, nerf, review on February 3, 2019 by BuffdaddyNerf. Nerf Modulus Ghost Ops Shadow Review Nerf Titan, Perses, Revoltinator, Megalodon Info Officially Released! Are the compatible with the other blasters? If you use them straight out of the box, yes. All the blasters will play with each other. You just can’t use the Laser Ops App with the “Classic” blasters.